The 3m x 3m is one of the most popular without a doubt. They are big enough to store all your gardening equipment (including larger machinery such as ride on mower) but still fit comfortably in most suburban backyards. They are also a popular option as a smaller workshop. 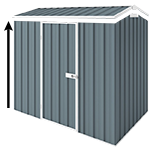 There are amazing possibilities to customise your shed and add a wide range of accessories. You can increase the standard 1.8m wall height to 2.1m but this is just the beginning. You can change the hinged doors to sliding doors, add louvre window, skylight, shelving, tool holders and the list goes on. This product comes with 20 year written warranty.